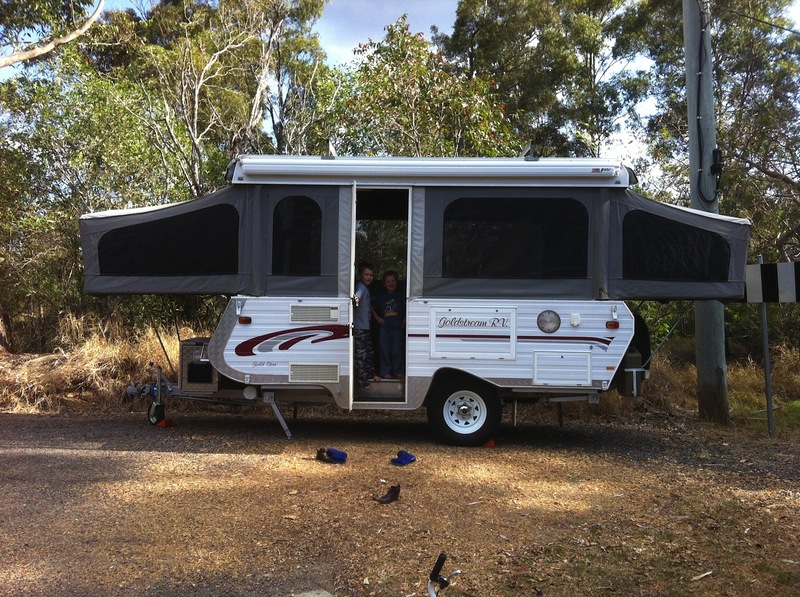 When we tell people that we are heading off around Australia, travelling with 3 kids aged 7 and under, with a camper trailer to live in which is probably smaller than the size of your average bedroom, for the next 6 or 7 months – many people think we are totally bonkers!! I know that perhaps it does seem crazy to jam a family together in such a confined environment for over 6 months, and maybe financially irresponsible to put the mortgage on hold, a step backwards to sell many of the possessions we have spent so many years accumulating, and perhaps even detrimental to the kids schooling ……… the list goes on. We are very lucky that our family and friends have been very supportive, positive and genuinely excited for us. However, we do still get a few – ‘you’re nuts!’ or ‘I’d rather chew my own arm off” comments and these make us think – eeeeeek – are we doing the right thing??? Are we crazy???? In my younger days I was a swimmer and at one point, our little country swimming club ended up with a very loud, diet-coke drinking, American swimming coach called Dave. I learnt a lot about working hard, goal setting and dreaming big during his time with us. Something else he tried to impress on us (big shout out to any Malanda Aquatic Dragons reading this!) was the importance of celebrating your success. He believed that if you won a race or swam a PB (personal best, for the non-swimmers out there) then you must celebrate – with a big fist pump or huge yell or even just a big grin & jump. Now – for a pretty shy, small town ‘aussie’ farm girl – this sort of behaviour didn’t come naturally. It seemed very ‘American’, very boastful and loud. It didn’t feel right and unfortunately I never went on to be an Olympic swimmer. However, I now believe that Dave was right. It is important and OK to ‘celebrate your sucess’. You’ve got to do something to make your self feel good, amazing even, after all the hard work …… otherwise, why on earth go back for more/to do it all again???? So, this trip for us is a big ‘fist pump’. It is a chance to celebrate the hard work Matt has done to get to the point of 10 years long service leave, to shout out ‘we survived!’ the sleep deprived baby years of raising three kids, to ‘jump & grin’ about the home we have managed to create and the life we have built that is pretty darn good so far! This trip is the reward and the motivation to start out on the next chapter of our lives – and it feels great!! We believe that sometimes it is important to stop, slow down, and ‘smell the roses’ a little. We feel like the last decade for us has passed mostly in a blur of shift work for Matt, buying and shfting houses, part-time work for me with a ‘hi/bye’ at 2pm as we swapped over work/house manager roles, sooooo many nappies and school pick ups and drop offs. We want to use this trip to spend time together as a family – cementing our bond, sealing in our family values, instilling a love of this beautiful land we live in and generally ‘loving’ each other! Our current life has been too busy, we have accumulated too many ‘things’ and our kids have no idea that you can actually wash dishes without a dishwasher! We want to change all that on this trip. We want to make life simple and re-programme some better habits for our life. On the trip we will only have 4 sets of clothes each and the kids will only be bringing some Lego and colouring books with them. There will be no TV. Our aim will be to eat healthy, fresh, yummy, basic meals (coke and chocolate addiction be gone! ), exercise every day, read lots, sleep lots, see lots, sing lots, draw lots, write lots, talk lots, laugh, and probably, fight and cry lots. Idealistic maybe, but it’s worth a shot! 4. Time out to Plan the next step in our Lives. I’m an eldest child. I’m a Virgo. I am an accountant. And Matt & my sister’s will tell you – I’m a bit ok, a lot Bossy. It is well known that I like to Plan, Set Goals and Make Lists – end of story. (yes, yes, family – I know it can be very annoying, but stuff gets done ok – so quit the ‘eye rolling’!!). So – Matt and I have been married 10 years this year, it is time to set the new 10 year plan. We have been fortunate that the last one was pretty straightforward. Travel lots – tick – just missed the living/working overseas thing due to the step below arriving a little ahead of schedule! Have lots of kids – getting there – tick. Be Happy/Live life to the full – mostly, tick. This next 10 year plan though, is much harder ………..
We’re not sure where we now want to live and raise our family, we’re not sure our careers are really the ones we want, we want to do more with our lives, to make a mark on the world – something GOOD, useful, fulfilling and challenging that will carry us far into our futures, but we have no idea how or what that should be! We’re hoping this trip will give us the time out to clear the mind and allow room for the mud map for the next 10 years to come to life ………….. we’re open to suggestions!?!? Pretty self explanatory – we want to live life to the full and to show our kids that they can do that too!! We want to get to the end of our life journey and know we filled it in to the brim with love, family, adventure, and that we gave everything we wanted to do, and even some that we didn’t, a ‘red hot go’. 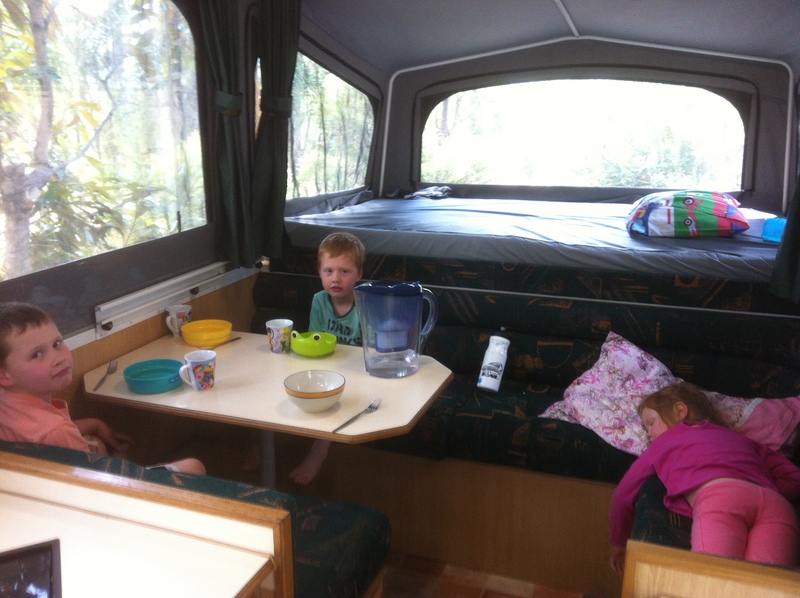 Travelling around Australia with our 3 young kids in a camper van is definitely one of those ‘must do’ things for us. So, in the words of Mary Oliver …………. Wow, you are strapping yourself in for another of Matt’s monster retrospective posts? Crazy! So, yes, like the decision of which car to get, there were plenty of lessons learned in choosing a camper. Tent …are you kidding me? No way…if we wanted to come home with the same number of family members as we left with, we were not tent-ing it. 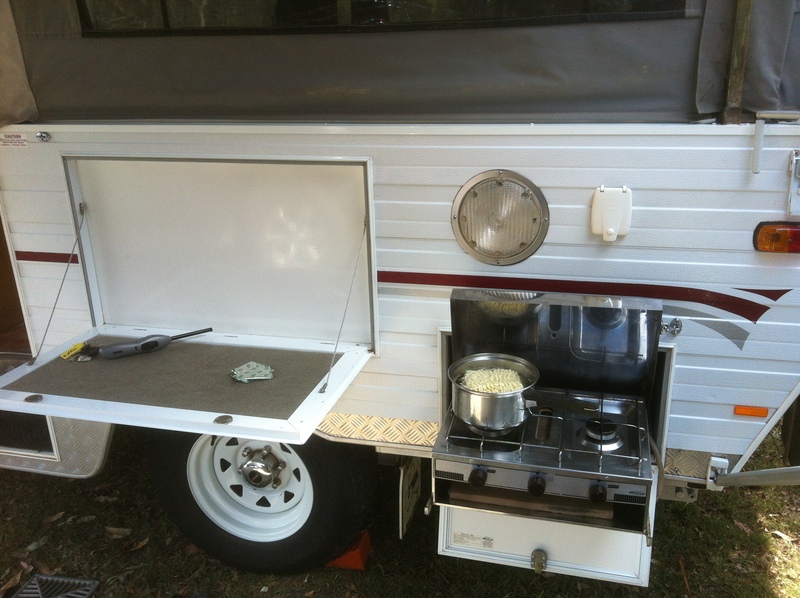 Softfloor camper…. Love the space, but the set up and pack down time, along with not being off the ground, wet canvas, and having to set up virtually the whole campsite every time, no thanks. We decided early on (and after some good advice from others who have done this/similar trips in the past) if it is not easy, you will avoid doing it, it will effect your decisions along the way, and you will end up skipping over/missing things because of the dread of the set up/pack down. Caravan…. easy tiger…. The kids might keep reminding me when they see ‘pre-kids’ photos of me of how much more hair I had, but we are still a good 30 years away from caravans thank you very much. So it was easy, it was going to have to be a wind-up camper-van. But which one? Jayco? Coromal? GoldStream? Coromal: Loved everything about the Coromals, except the price. Very well built, many with independent suspension, but I think because there are just so very few of them around, they hold their value really well. Had I found the right Coromal for the right price I would have bought it. GoldStream: Just do a google search and have a read of all the Goldstream owners reviews and comparisons to the companies above. The Goldstreams are a very well built piece of kit. Cabinets are stapled, bracketed and glued. Independent suspension, rock solid camper. 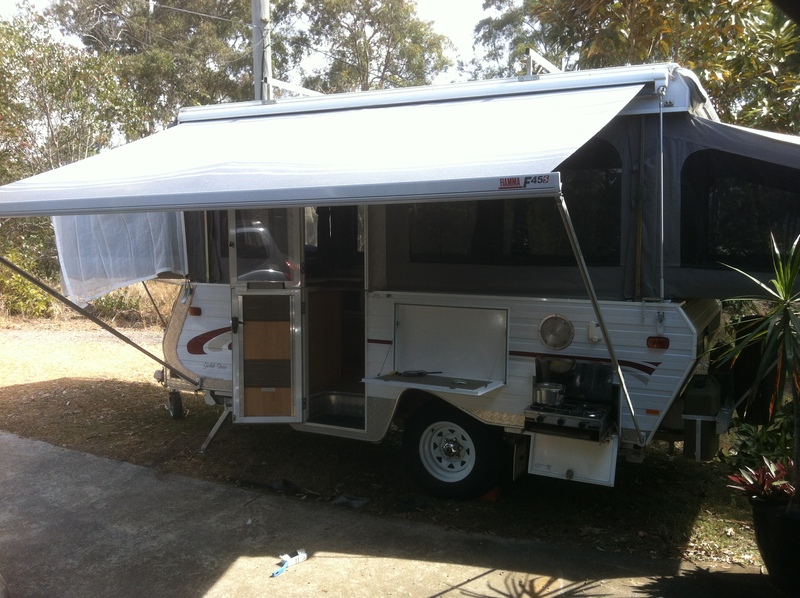 So it came down to Coromal and Goldstream, after over 12months of watching the camper market, it became clear that immediately after major holidays/school holiday is the time to buy. I guess anyone with a camper they are wishing to sell figure they will get one more camp out of it before they sell. 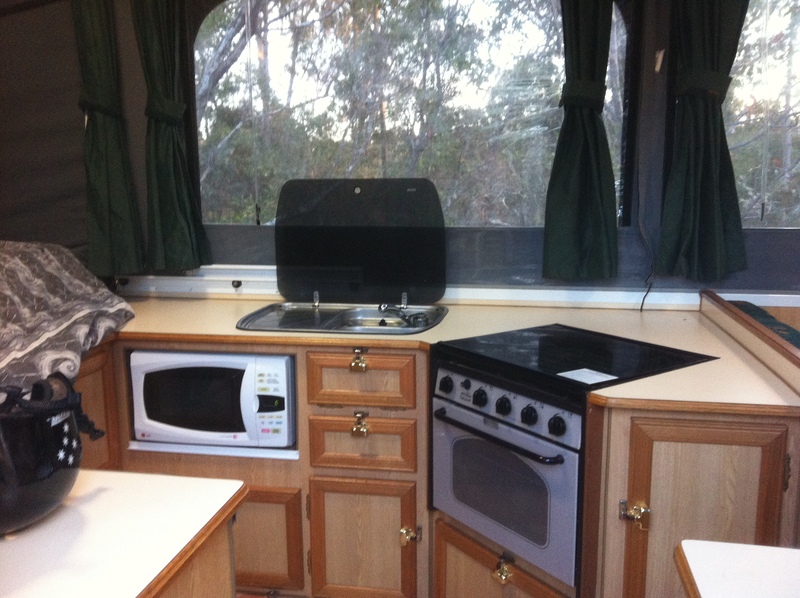 So watching for 12months I knew the market and values very well, so I knew when we saw a 2003 Goldstream GoldStar, with independent suspension, 120ltrs of water storage (and 2 x jerry holders on the rear bar) 120W solar, Gas Hot Water, external shower, external pull out BBQ, Fiamma, dual gas bottles, Generator box, full oven and Microwave and a TV to boot, in our price range (well…. within ‘upsell’ range I reckoned I could get past the accountant) I knew that as long as it actually had wheels then it was a go-er. So off we went and had a look. Turns out the owner had just completed their family ’round Oz’ trip in it and needed to off load it. Lovely people they were, and a great source of info regarding the trip as well. So after a little negotiations (and upselling to my accountant – who may or may not have been in New Zealand at the time!) we purchased Karen Camper. Here she is about 3 mins after we got home with her! You might have heard me say “we’ve got some learning to do” Well, well, well…. we certainly have done some learning. For example, here is a trap for young players, maybe I was just being blonde, but the way I read what I read about brake controllers, electric brakes etc was that any trailer over 750kg needs to have electric brakes…check (it has electric brakes) but brake controllers were just for more efficient braking (ie proportional braking, brake hard in the car, camper brakes go on hard, brake soft in the car, camper brakes softly) So while I thought we would definitely get a brake controller for the trip, I had NO IDEA that without a brake controller…….the camper has NO BRAKES. I towed it all the way home, and that weekend to Flanagans Reserve with no brakes! Like I said……we had some learning to do, and you know what, geez life would be boring if we didn’t learn something new everyday! Anyone else game to fess up their ‘rookie errors’? Oh – and we do now have a brake controller! A few photos of Karen Camper to finish off.